My anguish, and imitate, as far as you can, My grief. Fatima.org. Now, I know some people will groan at the thought of one more devotion. Maybe you’re not into devotions. Maybe you don’t think they’re a necessary part of the spiritual life and no Catholic is obligated to have any particular devotion. Fair enough. Devotions are not mandatory. However, you might want to take a look at this one. One day I woke up feeling very sorry for myself. Have you been there? Today was the day that I picked to have a grand old pity party. Things looked bleak. I even posted about it on social media. Thankfully someone recommended this devotion to me. I’m not a big devotion person although I have some devotions such as the daily rosary. Since this devotion involved a rosary, it was familiar to me – safe. I decided to pray it because it seemed , fairly comfortable and not too much of a stretch. I know, I know! And thus I began a journey that would change my way of thinking, incrementally, until it became what is today. Our Lord Jesus Christ understands our pain. The Blessed Virgin understands our pain. According to St Bridge of Sweden (1303-1373), there are Seven Graces of this devotion. 7. I have obtained this Grace from my Divine Son, that those who propagate this devotion to my tears and dolors, will be taken directly from this earthly life to eternal happiness since all their sins will be forgiven and my Son and I will be their eternal consolation and joy. Catholictradition.org. If you make it a habit to pray this devotion even once a week or once every two weeks and meditate on the promises, you will automatically be attracted to, and seek those things, which allow these promises to be fulfilled. Here are some examples of how this might come to pass. This devotion will encourage you to pray according to God’s will. After all, we are aligning our sufferings and our crosses the suffering virgin as well as our suffering Lord. We will grow to accept God’s will and pray according to His will for our lives. Doesn’t that automatically fulfill the 4th promise which says “I will give them as much as they ask for as long as it does not oppose the adorable will of my Divine Son or the sanctification of their souls”? 1233: seven youths in Tuscany founded the Servite Order (also known as the “Servite Friars”, or the “Order of the Servants of Mary”). 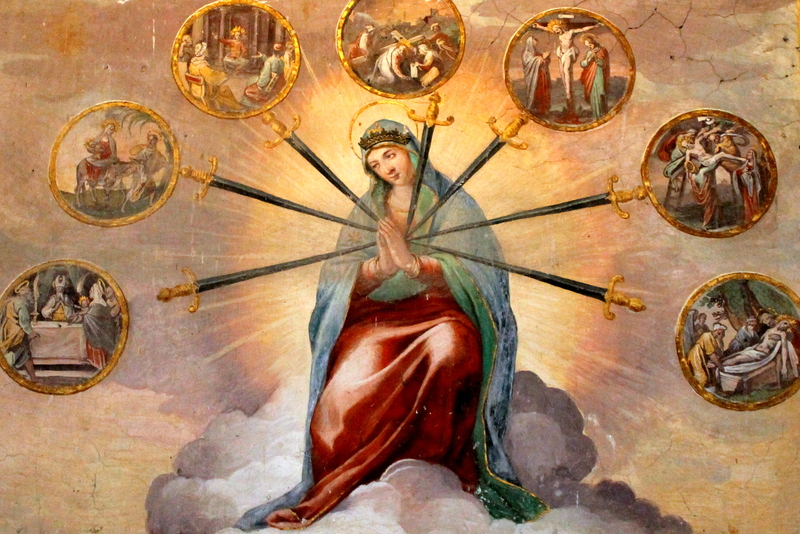 Five years later, they took up the sorrows of Mary, standing under the Cross, as the principal devotion of their order. 1814: in 1814, Pope Pius VII extends celebration to the whole of the Latin Church. Feast date set for third Sunday in September. 1913, Pope Pius X moved the feast to September 15. This is the current feast date. 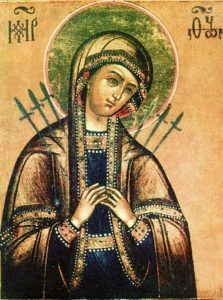 The East: On February 2, Eastern Catholics commemorate an icon of the Mother of God called, “Our Lady Who Softens Hearts” See Wiki for more history. So, how do I pray the Rosary (chaplet) of the Seven Sorrows of Mary? The easiest way is to pray the chaplet on the Rosary of the Seven Sorrows. You can either buy the Rosary of the Seven Sorrows or use a regular Rosary and make the necessary adjustments. Prayer booklet used in the video below. Learn how to pray the Rosary of the Seven Sorrows of Mary. Disclosure of Material Connection: “If you buy a product through one of the site links, we may get a commission without any extra cost to you. Thank you for supporting BeautySoAncient.com! You remind me of a big sister, teaching her brothers and sisters right from wrong. I thank God the Father, God the Son, and God the Holy Sprit for you. And I thank our blessed Mother for you. We’v been waiting for you! God bless you! I am humbled by your comment, Charmaine. Thank you! Please pray for me and I’ll pray for you! Sorrows of our lady’s devotion ,had always help me to turn my own sorrows into joy. I can’t afford to miss it again!.